The shrubby, scrub oaks of San Diego County are difficult to identify. They include the following species: (1) Nuttall's scrub oak (Quercus dumosa), an uncommon species along the immediate coast; (2) scrub oak (Q. berberidifolia), a chaparral species of the inland mountains and valleys; (3) Q. x grandidentata, a hybrid between the scrub oak (Q. berberidifolia) and Engelmann oak (Q. engelmannii); (4) scrub live oak (Q. wizlizenii var. frutescens); and (5) desert scrub oak (Q. cornelius-mulleri). A sixth scrub oak (Q. acutidens) is a widespread shrub or small tree. According to the Jepson Manual of California Plants (1993), it is a hybrid between Q. engelmannii and Q. cornelius-mulleri. The leaves of Q. acutidens are often entire or irregularly toothed. This shrub appears to be fairly common in the inland valleys and foothills of northern San Diego County (Escondido and Valley Center). I have removed the x in the specific epithet for Q. acutidens. Although this species is of hybrid origin, it appears to form a stable, interbreeding population in San Diego County. 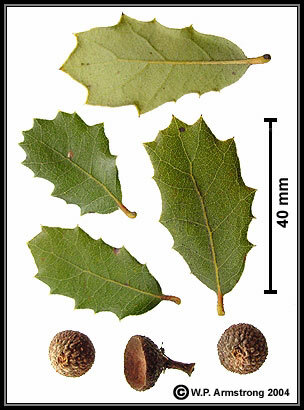 Scrub oaks from San Diego County; leaves and acorn from the Palomar College Herbarium: A. Quercus acutidens from the Escondido, Valley Center and Lake Wohlford region (elev. 240 m to 500 m). The blackened leaf is from the Paradise Fire of October 2003; B. Q. acutidens from the Lake Henshaw Dam spillway area (830 m). These leaves are irregularly-toothed and obovate; C. Q. cornelius-mulleri (probably this species) from Cuyamaca State Park (1300 m). The undersides of the leaves of Q. cornelius-mulleri are densely pubescent with overlapping, stellate trichomes (see the next photo). Leaves of Q. berberidifolia are similar in shape and size, but are not as densely pubescent on the underside. Q. cornelius-mulleri is called "desert scrub oak" and is common in the chaparral along the desert edge of the Laguna Mountains (Sunrise Highway). Quercus cornelius-mulleri: Magnified view (100 x) of the underside of a leaf showing the dense, overlapping, stellate trichomes (epidermal hairs branched from the base). Stellate hairs on the leaves of Q. acutidens and Q. berberidifolia are not as dense and do not overlap each other. 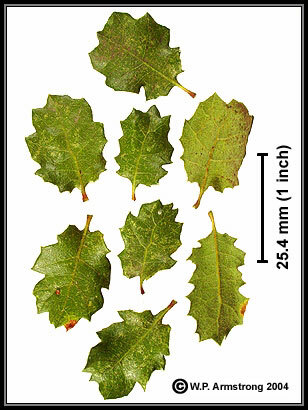 In drought resistant chaparral species, such as scrub oaks, the stomata are concentrated on the lower surface of leaves. Dense pubescence on the shady undersides of leaves allows the stomata to carry on gas exchange, while insulating the stomata and guard cells from dry winds that blow across the leaf surfaces. 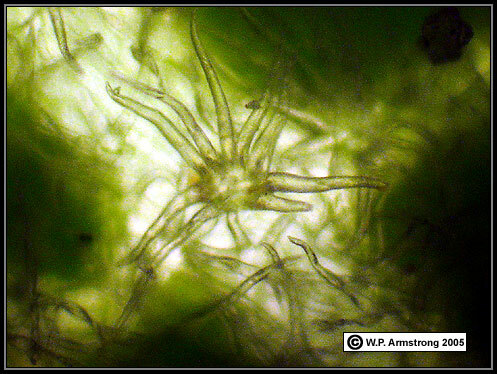 Magnified view (300 x) of the underside of a leaf of Quercus cornelius-mulleri showing a stellate trichome. This is an epidermal hair branched from the base. Stellate trichomes of Quercus cornelius-mulleri and Q. acutidens. The trichomes were scraped from the undersides of the leaves. Magnification 300x. A saucer gall on the upper leaf surface of Quercus cornelius-mulleri. 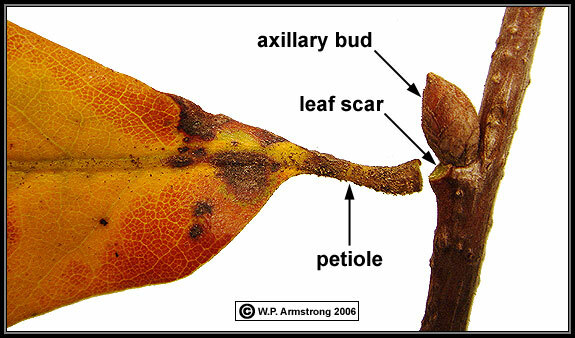 This uniquely-shaped gall is induced by the gall wasp Andricus gigas. A scrub oak about 10 feet (3 m) tall along I-15 north of Escondido (east of the Merriam Mountains, elev. 800 m). This appears to be Q. acutidens. The leaf blades are typically 30 to 50 mm in length. 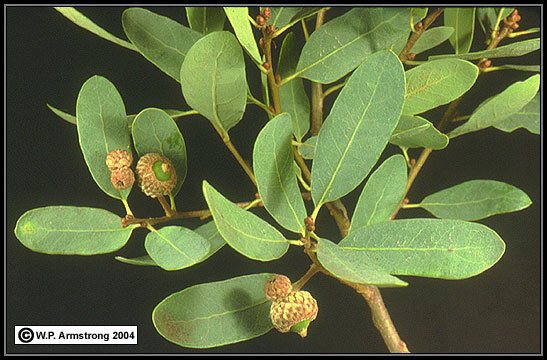 According to the Jepson Manual, leaf blades of Q. berberidifolia are generally smaller, typically 15 to 30 mm long. Quercus acutidens north of Escondido in San Diego County. In January 2006, at least 30 percent of the leaves in this population appeared to be deciduous. In the closely-related Q. engelmannii, leaves drop as the new spring foliage emerges from axillary buds. This condition is called "late deciduous" or "tardily deciduous." A typical branchlet tip of Quercus acutidens in January 2006. Quercus acutidens showing close-up view of deciduous leaf in early January 2006. 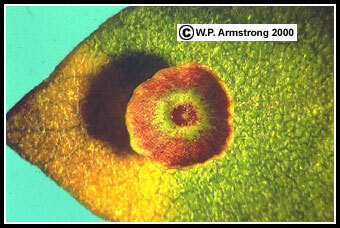 Quercus acutidens: Magnified view (100 x) of the underside of a leaf showing the stellate trichomes (red arrow). Unlike the leaves of Q. cornelius-mulleri, the hairs are not as dense and do not overlap each other. The density of stellate trichomes is characteristic of Q. acutidens (30-50 per 4 mm^2), not as densely pubescent as Q. cornelius-mulleri. The leaves of scrub live oak (Q. wizlizenii var. frutescens) are glabrous on the underside. 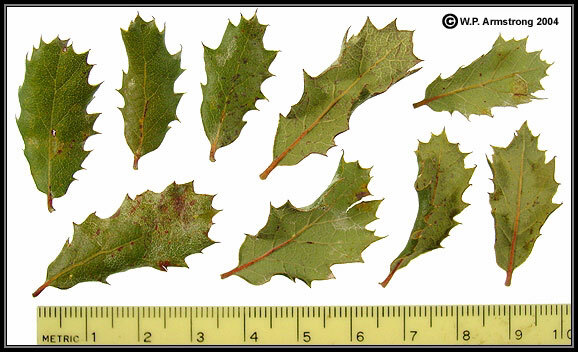 Assorted leaves from a scrub oak along I-15 north of Escondido (east of the Merriam Mountains, elev. 800 m). The largest leaf blades exceed 50 mm, so the leaves are within the size range for Q. acutidens, too large for Q. berberidifolia. 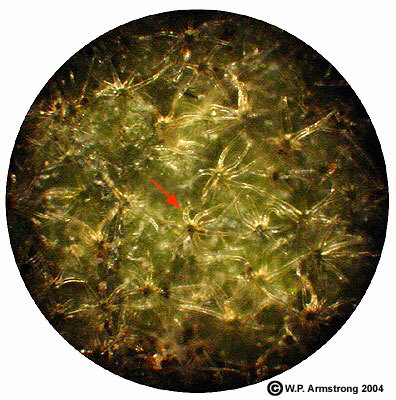 The density of stellate trichomes on the undersides of leaves is similar to that in above images of Q. acutidens (30-50 per 4 mm^2), but not as densely pubescent as Q. cornelius-mulleri. 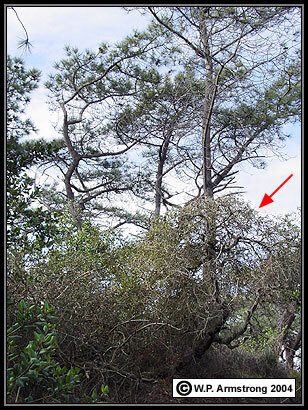 Quercus dumosa (red arrow) growing in the understory of a Torrey pine (Pinus torreyana) at Torrey Pines State Park (200 m). 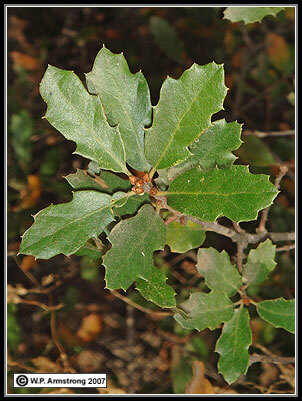 The small, spiny-toothed leaves are 12 to 25 mm long, smaller than the other scrub oaks of San Diego County. The undersides of leaves have sparse, erect, curly trichomes. This species is called Nuttall's scrub oak and is listed as rare in the Jepson Manual of California Plants (1993). It grows in sandy soils along the coast of southern California and adjacent Baja California. It also grows on Otay Mesa in southern San Diego County. 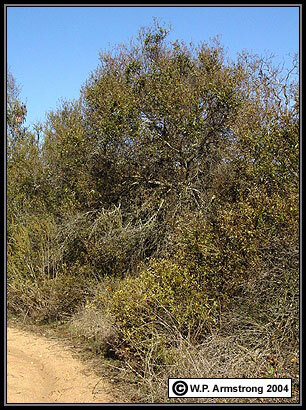 In older references, the name Quercus dumosa was also applied to scrub oaks of inland San Diego County, including Q. berberidifolia and probably Q. acutidens. 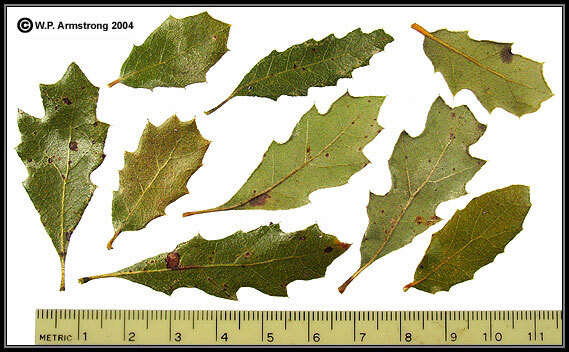 Assorted leaves from a scrub oak at Inaja Memorial Park southeast of Santa Ysabel (elev. 950 m). The largest leaf blades do not exceed 35 mm, so the leaves are within the size range for Q. berberidifolia; however, this is also within the size range for Q. acutidens. Most of the leaves are 20 to 35 mm in length. They are uniformly spiny-toothed and are painful to grasp. The density of stellate trichomes on the undersides of leaves is similar to Q. acutidens (30-50 per 4 mm^2), but not as densely pubescent as Q. cornelius-mulleri. Magnified view (100 x) of the underside of a leaf from the above scrub oak at Inaja Memorial Park showing the stellate trichomes (red arrow). The shape and size of the leaf blades are within the range for Q. berberidifolia and Q. acutidens. 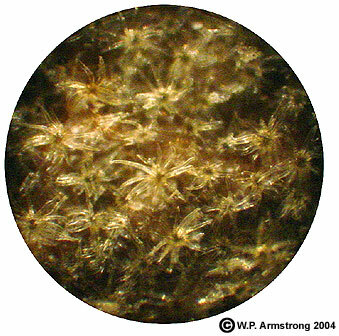 The density of stellate trichomes is similar to Q. acutidens, approximately 30-50 per 4 mm^2. The trichomes are not as dense as Q. cornelius-mulleri, and they generally do not overlap each other. 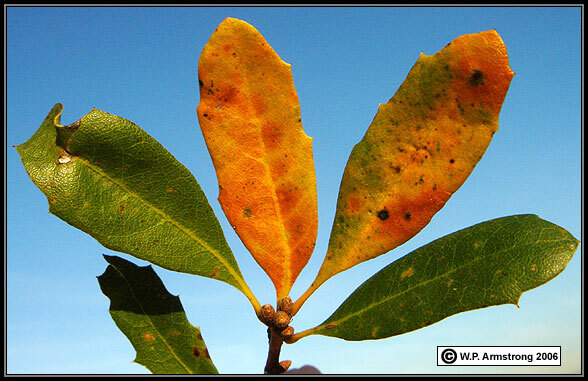 Assorted leaves from a scrub oak near the Cuyamaca Dam Spillway (elev. 1280 m). The shape and size of the leaf blades are within the range for Q. berberidifolia and Q. acutidens. Most of the leaves are 20 to 35 mm in length. 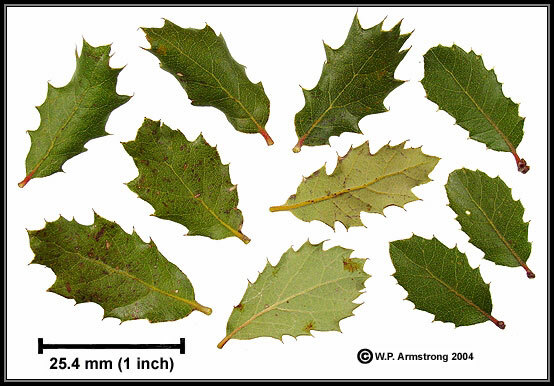 The holly-like leaves are uniformly spiny-toothed and painful to grasp. 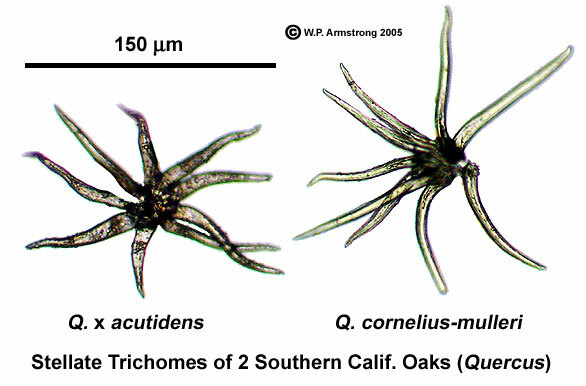 Compared with the above images of Q. acutidens, the density of stellate trichomes appears to be slightly lower, approximately 20-30 per 4 mm^2. Magnified view (100 x) of the underside of a leaf from a scrub oak at Cuyamaca Dam Spillway showing the stellate trichomes (red arrows). The shape and size of the leaf blades are within the range for Q. berberidifolia and Q. acutidens. 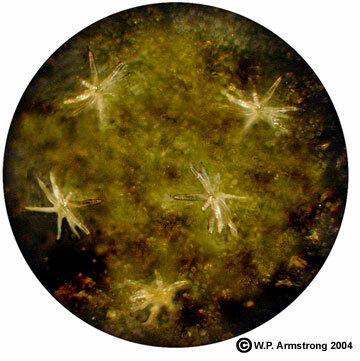 Compared with the above images of Q. acutidens, the density of stellate trichomes appears to be slightly lower, approximately 20-30 per 4 mm^2. Quercus berberidifolia From The Santa Monica Mts. 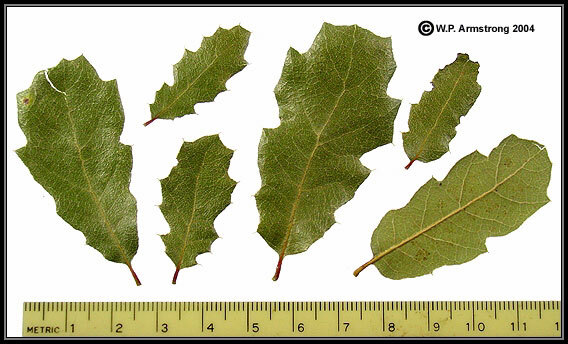 Assorted leaves from a scrub oak in the Santa Monica Mountains of Los Angeles County. The shape and size of the leaf blades are within the range for Q. berberidifolia and Q. acutidens. 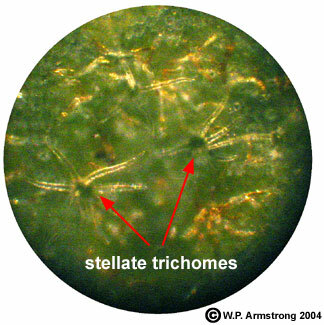 Compared with the above images of Q. acutidens, the density of stellate trichomes appears to be much lower, approximately 10 per 4 mm^2. Based upon the low trichome density, Q. acutidens can probably be ruled out. This image was enhanced with PhotoShop to bring out the trichomes. Magnified view (100 x) of the underside of a leaf from a scrub oak in the Santa Monica Mts. 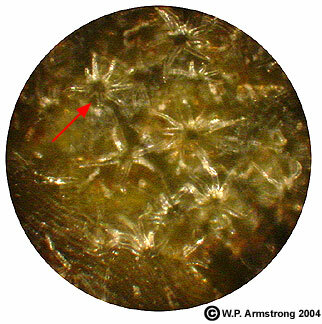 (previous image) showing the stellate trichomes. The shape and size of the leaf blades are within the range for Q. berberidifolia and Q. acutidens. Compared with the above images of Q. acutidens, the density of stellate trichomes appears to be much lower, approximately 10 per 4 mm^2. Based upon the low trichome density, Q. acutidens can be ruled out. This image was enhanced with PhotoShop to bring out the trichomes. 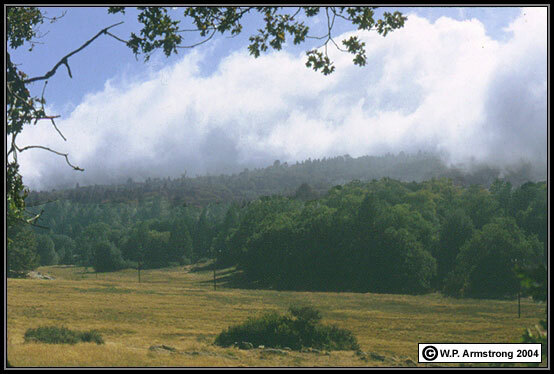 Cuyamaca State Park in San Diego County, California. This beautiful forest contains California black oak (Quercus kelloggii), canyon live oak (Q. chysolepis), Engelmann oak (Q. engelmannii), interior live oak (Q. agrifolia var. oxyadenia), interior scrub oak (Q. wislizenii var. 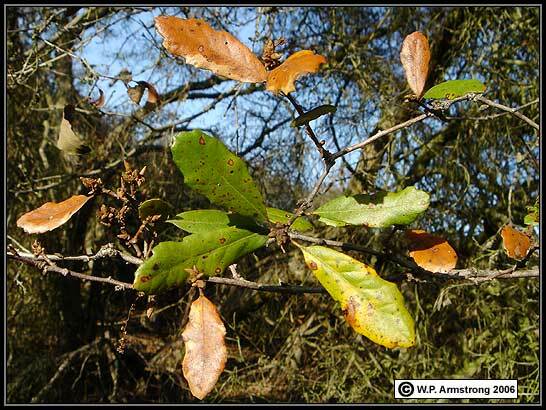 frutescens), oracle oak (Q. x morehus), and interior scrub oak (Q. berberidifolia). [Some of the scrub oaks appear very close to Q. cornelius-mulleri.] This forest also included perhaps the largest canyon live oak ever recorded. Unfortunately, it was destroyed in the Cedar Fire of October 2003. Canyon live oak (Quercus chrysolepis). 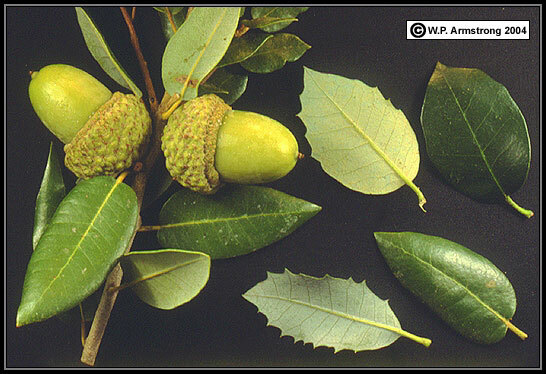 This species is characterized by large acorns with thick cups. The leaves may have toothed or entire margins, and the undersides are pale whitish or yellowish. Canyon live oaks can be large shrubs or enormous trees. One of the largest canyon live oaks ever recorded grew in Cuyamaca State Park. Unfortunately, it was destroyed in the Cedar Fire of October 2003. Engelmann oak (Quercus engelmannii). This species can easily be recognized by it oval, blue-green leaves with entire margins. 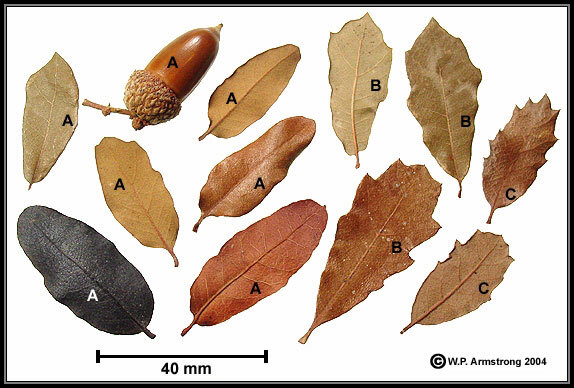 This is also the parental species for several hybrid oaks, including Q. x grandidentata (Q. engelmannii x Q. berberidifolia) and Q. acutidens (Q. engelmannii x Q. cornelius-mulleri). Q. acutidens appears to be quite common in San Diego County and may be a separate species. Left: Channel Islands scrub oak (Quercus pacifica). This species is similar to some populations of Q. acutidens in San Diego County. Right: Island oak (Q. tomentella), a species that also grows in Baja California and on Guadalupe Island. 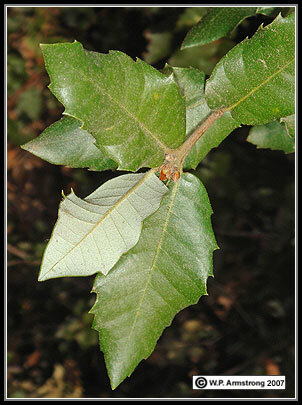 The leaves are similar to canyon live oak (Q. chrysolepis) in San Diego County.